Online ordering menu for Next Door Pub & Pizzeria. Go to “Next Door” for the flavors of the Lake Geneva neighborhood. 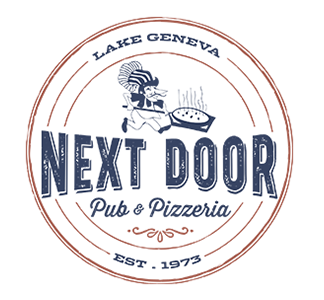 With great food, pleasant service, and friendly atmosphere, you’ll find Next Door Pub to be a regular destination when you visit Lake Geneva. Their pizza is a local favorite, made from scratch from crust to sauce to bring out the best flavors. Conveniently located at 411 Interchange N, near Hwy. 12, Next Door Pub is only about 5 Blocks from Geneva Lake and many of the area golf courses. Order online for take-out and delivery!